Fishing at the Dalles, 1850, pencil drawing by George Catlin. Source: NYPL. I’m probably the last person to get the memo that you can fire a harpoon with a bow and arrow. In fact, I only just got my head around firing a harpoon with an atlatl. Anyway, take a squint at the picture above – the figure in the lower left background is clearly shooting a harpoon-arrow from his bow. The picture is from about 1850 and is a pencil drawing of a scene at The Dalles, on the Columbia River. I’ll take a closer look at this picture below. In the detail above, you can see more clearly that the boy is standing on a rock above an eddy, aiming straight down. Presumably the tactic is to wait motionless until a fish swims underneath, allowing him to aim with less concern for the refraction of the water. Then the typical advantages of the bow and arrow come into play: high velocity and an almost motionless release (slight motion of fingertips) allow the fish precious little time to react before it is skewered. Flat Head. Hoogst-ah-a, second chief of the tribe, with a blanket wrapped around him; A Flathead woman, wife of the Chief, basketing salmon, at the Dalles, on the Columbia River; A Flathead boy, shooting salmon with his harpoon arrows, as they are passing the Dalles. The picture is a pencil drawing by George Catlin, a well-known 19th century artist of the west, especially those showing Native Americans. It is from one of his lesser known books, the magisterially-titled (yet apparently self-published) “Souvenir of the N.American Indians as they were in the middle of the Nineteenth Century, A numerous and noble Race of Human Beings fast passing to extinction leaving no Monuments or Records of their own in existence”. That’s a mouthful, mostly of balderdash. If you don’t happen to have your copy handy, you can view the whole thing at the New York Public Library website here. The NYPL website actually has a lot of interesting documents on file including scans of rare books, postcards, ephemera and the like. I’ve got tons of bookmarks to materials from it. The new beta search engine is good, but the old one is somewhat simpler to use and easier to access captions – work outwards from here, for example. They also allow searches to be persistent – I bookmarked this page over three years ago and it still works. Anyway, in the above image detail (original here) you can see the same boy, identified by the name “Yun-ne-yow (the Green Vine the Creeps[? ])” posing with his bow and harpoon-arrow. The lanyard is attached to about 1/4 of the way along the arrow from the tip, and is tied off at one end of the bow. He has it sort of casually wrapped around the bow presumably as a way to keep from tripping on the lanyard — it’s a nice human touch. I’m calling this rig a harpoon even though the arrow-head doesn’t detach, if any of you weapons types wants to correct me then go ahead. Basically it is an arrow with a string tied onto it and shows that you don’t always have to overthink your technology. An interesting aspect of this system is that archaeologically, we might normally only recover a stone “arrowhead”, and ascribe it perhaps to land-mammal hunting. It’d be a bold archaeologist who started routinely cataloguing small triangular, stemmed or side-notched late period flaked stone points as harpoon-heads! 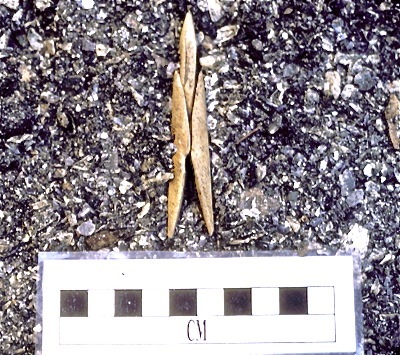 But, if memory serves me well, some of the famous sites at the Dalles are chock-full of small “arrowheads” – as in, ridiculously high densities of these. Virginia Butler quotes an estimate that one collector dug up over 150,000 of these. I’m not really a bold archaeologist so I’m going to leave it at that. If know a lot about the Dalles, have an opinion on harpoon-arrows, or are just pretty bold, then feel free to add some comments below. Flat Head. Ya-tax-ta-coo, a Flathead (Chinook) warrior; Yun-ne-yow (the Green Vine the Creeps), a boy with his salmon bow; Chinook woman, with her infant undergoing the process of flattening the head. Now you might be wondering if such a device would actually work, and as usual in this modern age, dear reader, the answer lies on Youtube. This entry was posted in anthropology, Archaeology, First Nations, history, Northwest Coast, Oregon, Technology, Washington State and tagged bow and arrow, Chinook, Columbia River, fishing, harpoons, Oregon, salmon, The Dalles, Washington State. Bookmark the permalink. In our book Homeland, we demonstrated that basic, Ishi-type bows could effectively dispatch living bison with Paleoindian project points mounted on arrow shafts (at distance of 20 yards). Our conclusion is that “size doesn’t matter” and we sometimes make wrong assumptions about atlatl v.s. bow projectile points.Good to see the Catlin direct historical approach. As a kid and a teen I was involved in archery competitions and, although I stopped at the age of 16, I bow-hunted and bow-fished. I had a home-made spool attached to the bow, facing forward and strung with cord fishing line (not monofilament). Attach arrow, shoot same — and the line unwound from the reel/spool. I thought I was a genius for “inventing” this until I discovered that bow-fishing was common, especially along the St. Lawrence. Nothing new under the sun Mike! Thank you for the site info. I have enjoyed doing research on line – now that is a whole new world. What we discover in those old archives is a treasure. And thanks all others for your responses too; I saw this kind of bow fishing up around Hazelton as a kid. Marcia, Larry, Mike: thanks for your comments. Larry – you are no doubt aware of the emerging evidence from the ice patches which shows fairly conclusively that atlatl darts were all sizes and were mounted with an unexpectedly diverse set of projectile tips (especially considering the target species was likely almost all caribou). I saw a recent poster at a conference on some Wyoming or Colorado ice patch technology and I’ll see if I can dredge up a copy — foreshafts over a metre long with a little stub of fletching! Almost like an opposites-day game. Yes, I have seen Craig Lee and Bill McConnell’s constructions. Bill has pretty much perfected the foreshaft composite system for hunting. Doing survey work on the Columbia Plateau, I was told that points even an inch long were “not arrowheads” as they were too big. This drawing, unless Catlin enlarged the point for artistic purposes, seems to be around that “too big” range. Another bit of fieldwork hearsay, bison kill sites from the Great Plains had points that were called “bird points” (i.e. about 1.5-2 cm), the idea being that the smaller points were more likely to pass between the ribs. I think “bird points” were named as such because some people thought they were small for shooting birds. We found “bird points” effective in out study with Ishi bows on Tom Brokaw’s bison (see Homeland: An Archaeologist’s View of Yellowstone Country’s Past). Quentin, if you can find that ice patch atlatl info or post some references or links, it would be much appreciated! Scott: References for that research. Careful with the Antiquity reference, if you go to Antiquity it won’t be in the journal proper but in another area called the “Project Gallery”. Ice patches are turning up amazing things having to do with the atl-atl to bow and arrow transition, especially in Yukon. The latest can be found in a great volume of Arctic (in which Lee has a paper) edited by Tom Andrews and Glen Mackay (the latter Quentin will be proud to tell you being a UVic grad). Craig M. Lee, 2012: Withering snow and ice in the mid-latitudes: A new archaeological and paleobiological record for the Rocky Mountain region. Arctic, 65 Supplement 1: 165-177. Craig M. Lee, 2011: Ice patch archaeology in Yellowstone’s Northern Ranges. In MacDonald, D. H. and Hale, E. S. (eds.) Yellowstone Archaeology: A Synthesis of Archaeological Papers on the Prehistory and History of Yellowstone National Park: Volume 1, Northern Yellowstone. 132 143. Craig M. Lee, 2010: Global warming reveals wooden artefact frozen over 10,000 years ago in the Rocky Mountains. Antiquity, 84(325). Hare, P. Gregory, S. Greer, R. Gotthardt, R. Farnell, V. Bowyer, C. Schweger and Diane Strand, 2004. Ethnographic and Archaeological Investigations of Alpine Ice Patches, Southwest Yukon, Canada. Arctic 57-3: 260-272. Also, in this same volume I am pretty sure, is a study of the feathers used for fletching on the darts and arrows. I can’t resist because Mike’s post brought back memories. As a kid I always had a slingshot, my favourite, which I still have, is made of moulded fiberglass with a hollow handle (hole at top only) that will hold 1/4 inch shot (stop a rabbit) or smaller BBs. I tried shooting arrows but that didn’t work until I made an arrow rest out of a coat hanger, that would attach to the arms, with a dip in the middle to allow the fletching to pass. I’d tie nylon string to that and get carp in the river, and bullfrogs. Good eating. A pouch full of regular BBs was good for pigeons on the fly. I’d bet regular slings were in fairly common usage in the North American past, once you get the hang of the overhand technique reasonable accuracy is possible. A load of small stones into a flock of birds would be effective, but I never tried that with a sling. If anybody’s interested in making slingshots today, get surgical rubber from medical supply stores, perhaps 30 lb pull from that stuff, about the same as a simple self bow. Growing up in Canada in the 50’s and early 60’s we were a bloodthirsty lot. At 9, living in North Bay, I actually had a snare line with another boy and the two of us went out into the bush on snowshoes for hare. We lived on bushlore and if we could work out ways to do this it simply demonstrates an ingenuity our distant ancestors would have had to a much more heightened degree — out of sheer necessity. I very much doubt that childhood would have been the helpless, parasitic, dependent state of affairs it is today; everyone would have played a part because survival odds increased accordingly. Regrettably, where bow-fishing and other pursuits were concerned, the materials that would have been employed simply didn’t survive in the archaeological record. I wonder how much else we’re missing…. Mike, not sure how to get your personal email from this blog so am using valuable intellectual space here maybe, but similar childhoods, me in Trenton, snare line out back of the elementary school in Grades 7&8. Walking around with rifles was no problem, the magic age for that was 12. Everything I shot and snared we ate. Well, just about everything… We’re not good at recognizing children in the archaeological record, though some have tried. Bob Dawe makes a good case that at least some of the many tiny arrow points at Head-Smashed-In Buffalo Jump were made by kids. Also I agree that people of the past had ingenuity that we can only begin to imagine and of that, only a bit is preserved in the material record. And they were tough. Yeah, Mad — but we both know what the reaction would be to a kid in the ‘hood with a weapon today: SWAT time. One cultural horizon’s skillset is another one’s nightmare. I’ve spent some time wondering if some of the chipped stone hafted bifaces during the Late Period might be the arming elements for composite harpoons, but as I believe Carlson points out in his chapter in his 2008 volume the thickness doesn’t match with the slots of the bone and antler harpoon valves found in most assemblages. Hi Adam, thanks for your comment. What does fit those slots then if not the little flaked triangular points? Ground slate ones tend to be pretty thick. Mussel ones are pretty rare, though of course recovery and recognition is poor. Some of them take cylindrical bone points of course, cf. Shannon King thesis. But the slotted ones … yeah, ok, it’d be good to know more. Thanks for pointing me to Carlson – that’s the NW PP volume from SFU press, right? I have not seen the slots but slate sounds right. Check out Yupik, Inuoiat or Thule harpoon. Check out Ford or the Smithsonian collection. I have several slate insert points that are 1/16 inch thick and quite capable of piercing the skin if a 900.lb bearded seal or 2,000 walrus. Native copper is a small possibility. Take a serious look a Edward Nelson’ s The Eskimo Abot The Bering Sea for Yupik technology. Both Carlson and Keddie in the SFU volume mention issues with inferring function thanks to the ethnographic examples being made out of iron. Or if they were out of stone were produced for Euroamerican/canadians, and so often larger and more stylistically embellished than archaeological ones. However, just because many of the chipped stone and ground slate points don’t fit into composite harpoon valves (which King does mention several size classes for slots if I recall correctly) doesn’t mean that they weren’t harpoons since all you really need is a line attachment on the foreshaft. The problem is, the lack of archaeologically preserved foreshafts. 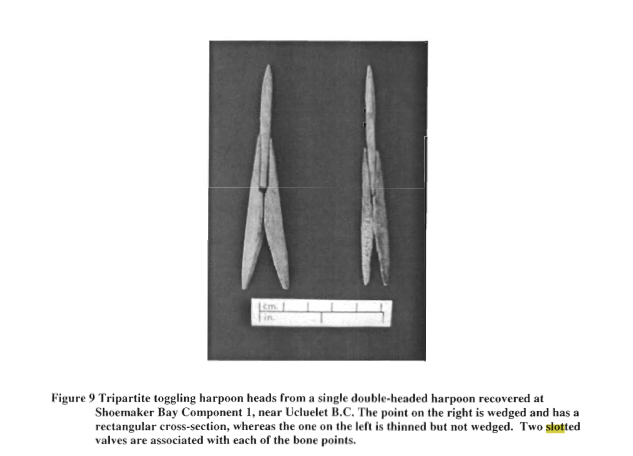 Looking at Hoko and ethnographic accounts (Elmendorf accounts of the Twana particularly) wood and bone were also important for arming elements, and I believe in the Hoko report a few were mentioned as refitting rather well with harpoon valves. 2012 Huu7ii: Household Archaeology at a Nuu-chah-nulth Village Site in Barkley Sound. Archaeology Press, Simon Fraser University, Burnaby, BC. Thanks Adam and twoeyes. Adam, not sure what you mean — the composite toggling harpoon (CTH) valves have a socket which would go into the harpoon I think, not onto a detachable foreshaft. That is, they are not attached to the foreshaft, but to the line (lanyard). So the problem remains of whether the small triangular chipped or ground points could attach to a slottted CTH. http://summit.sfu.ca/item/8311 but her topic is bone points so I don’t think she gets into slate or flaked stone much. I don’t have time to revisit it at the moment. I think a lot of the examples she had were not slotted but had a groove (a “channel” in the typology) to receive a cylindrical bone point – her abrupt-tipped category, often with impact fractures. This was her strongest result in terms of making sense of the continuum of bone points! On the other hand, she has the illustration below of two slotted points armed with wedge-based cylindrical bone points, which may answer the ultimate question of what fits into the slotted CTHs. These two were found close together and are interpreted as the arming points of a double-headed harpoon-leister probably for fish.